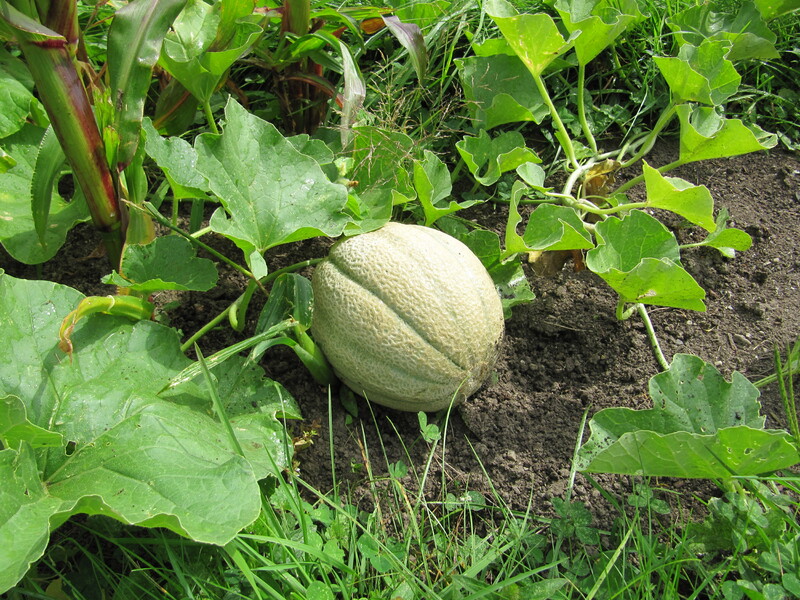 I have tried to plant melons in the past, with limited success. Last summer I saved some seeds from a melon we got from our farm share and planted them directly in the ground in spring. 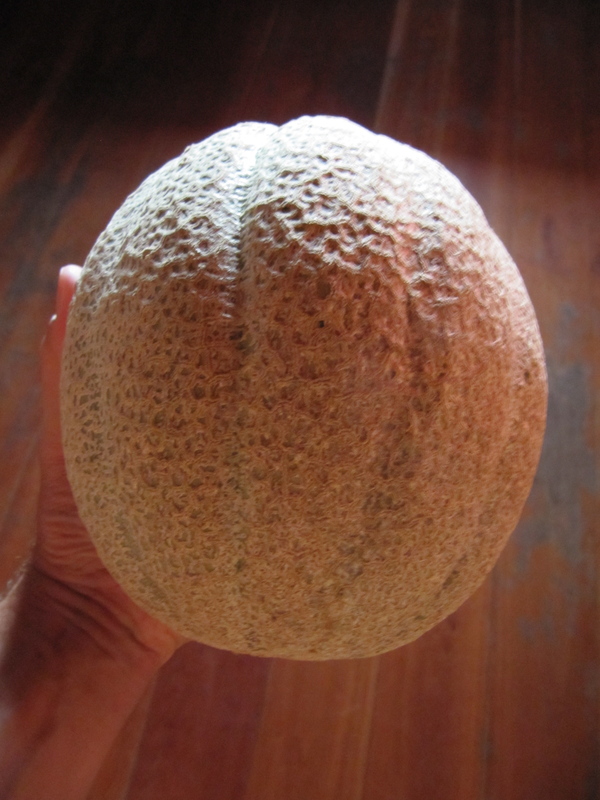 I guess we had a good combination of sun and rain, because I picked the first of what I hope to be several melons today. I cut it up and we sat out on the porch in the early light and ate it together. The sun was not too hot yet on this 90 degree plus day and we savored the cool sweet flavor of summer. I have to admit I am pretty fired up to have grown some melons. I love those things. I already have seeds drying to plant next year. Maybe they will work just as well. I am hoping I get more from these plants as well. Summer has one more hit of heat this week (at least two more days in the 90’s!) and then we taper to fall. I want to taste it a little longer. 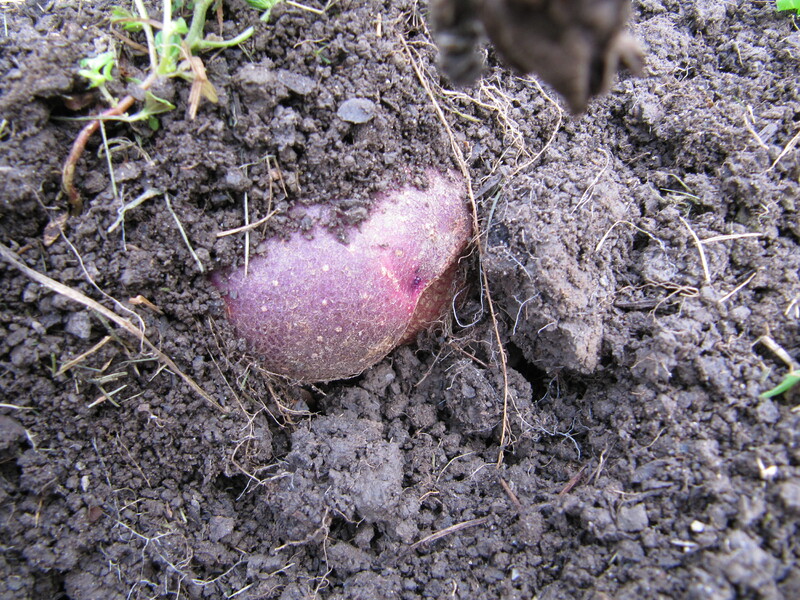 The kids and I dug up all our potatoes the day before yesterday. It was like digging for buried treasure. They had as much of a blast as I did. 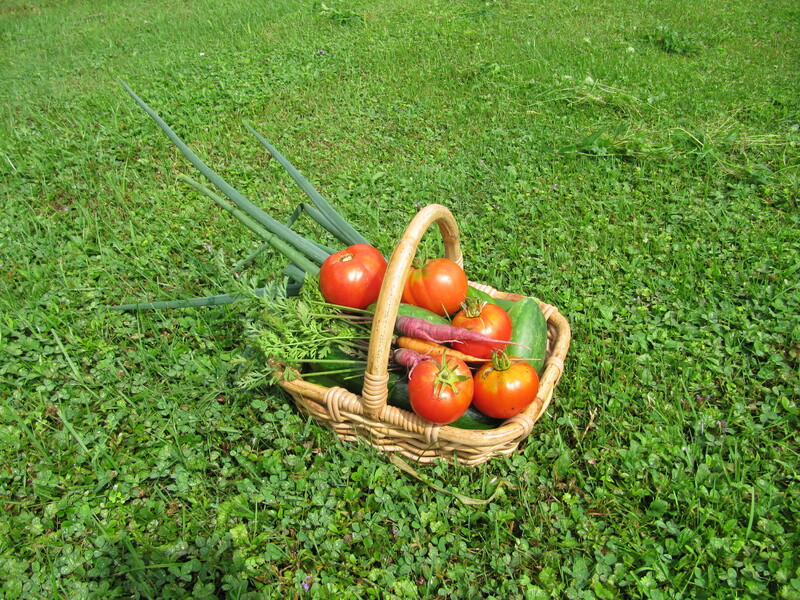 Turn the soil and find some food. I wish I had a scale. I have thought maybe 149 times that I could use one, but I have not taken the effort to get one. 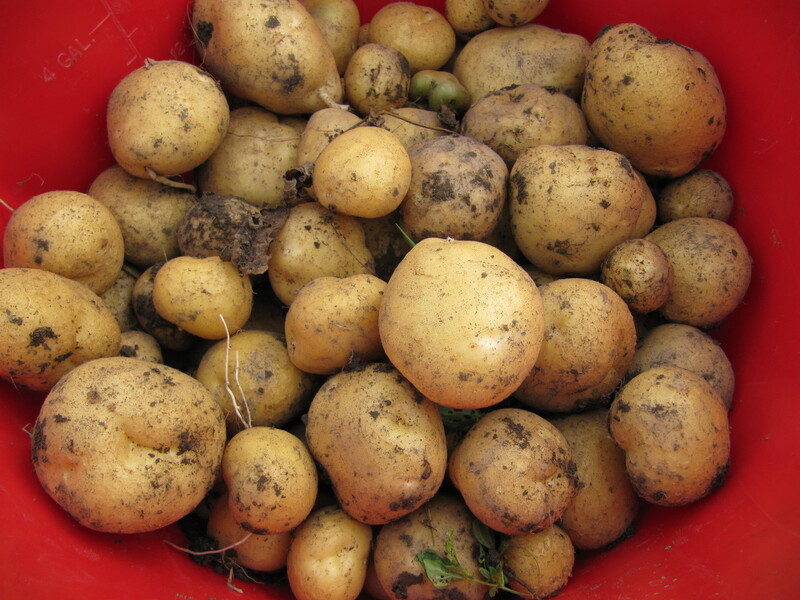 I planted five pounds of seed potatoes and all told, with the potatoes we already pulled from the dirt earlier this summer, we harvested 40-50 pounds of potatoes. That is a guess, of course, but probably close. That paid off. We have two varieties–one purple and one white. Right after we dug them up we boiled some of the white one and ate them with salt and butter, along with the corn we bought. A simple and fine dinner. 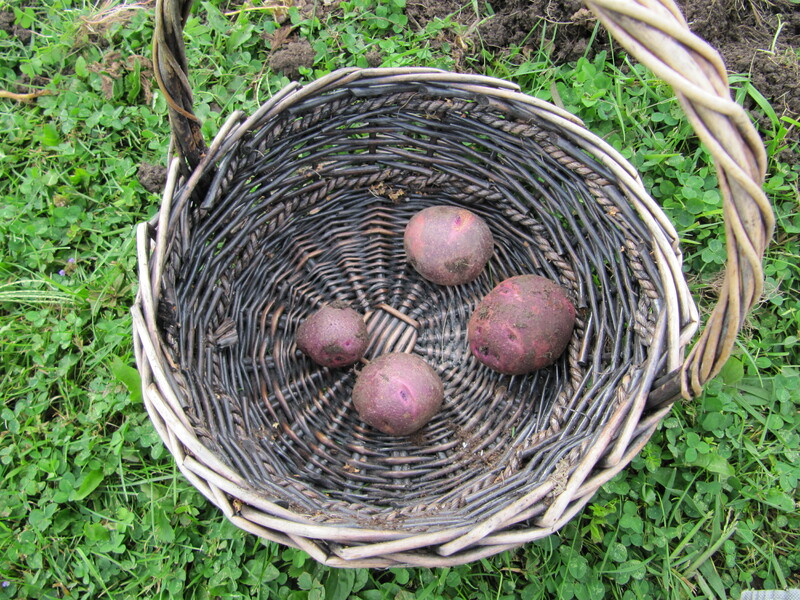 I plan to store a bunch of them so we can be eating potatoes at least into the fall. Hopefully I can make them last. I still need to pull the onions. They won’t keep as long but they will last for a couple of months. And I need to make pesto. And those melons are looking close to ripe. And pumpkins. We’ve got lots of food these days. 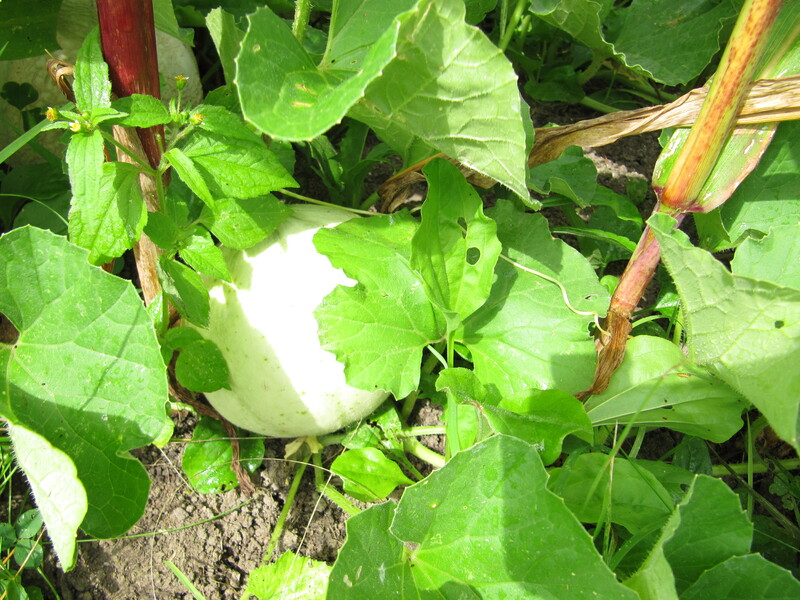 And speaking of melons, I just may be successful this year. I don’t want to speak before I actually pick and eat a ripe melon, but we are close. I saved seeds from a chanterais we got from our farm share last summer. They started off well, they blossomed and a couple of fruits started growing. Now, a couple of them are close to ripe, good sized, and healthy. 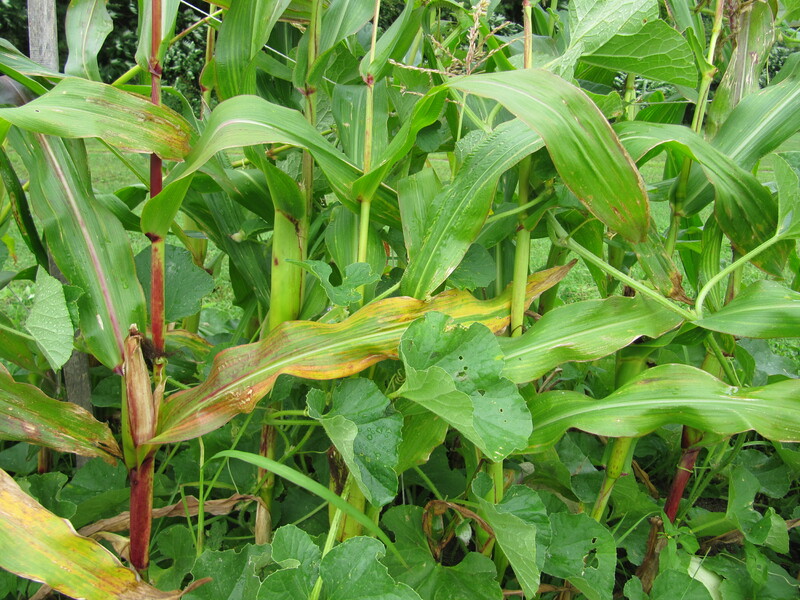 Seeking carefully under the corn plants, I found ten of them in various stages of growth. There are still more blossoms but those late bloomers will likely not make it at this point. 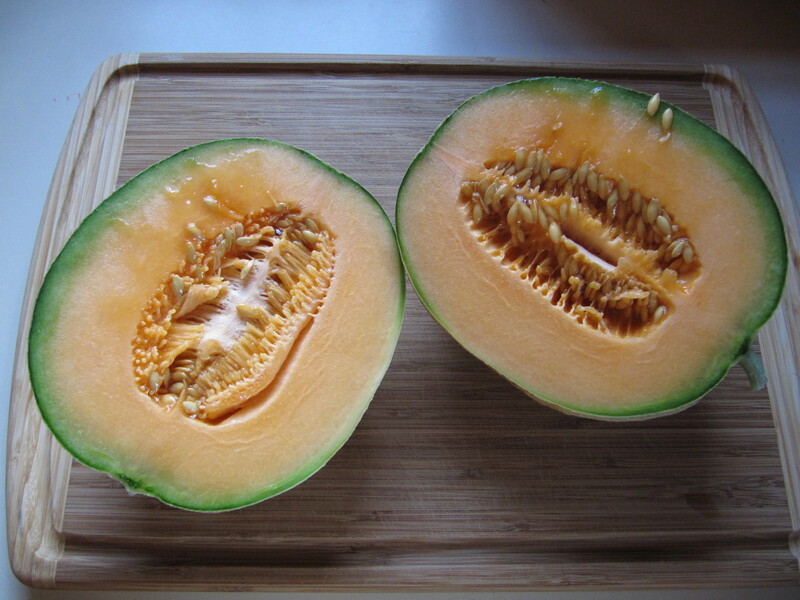 If we eat one or two tasty melons I will be a happy camper gardener. And I did finally pull the garlic. I could have yanked it all sooner, but today was the day I got around to it. I harvested 19 remaining bulbs. I already used one of them to make some pesto–OK, a lot of pesto–and I will need to save maybe five of them to plant this fall for next year, but that leaves 13. Not bad, considering how much I already used. So it was a good day for fresh food. We ate pesto pasta for dinner with tomatoes, cucumbers on the side. I need to dig up potatoes next. They are ready to make it to the table now as well. Right now I plan to have another slice of zucchini blueberry bread. It is still warm. 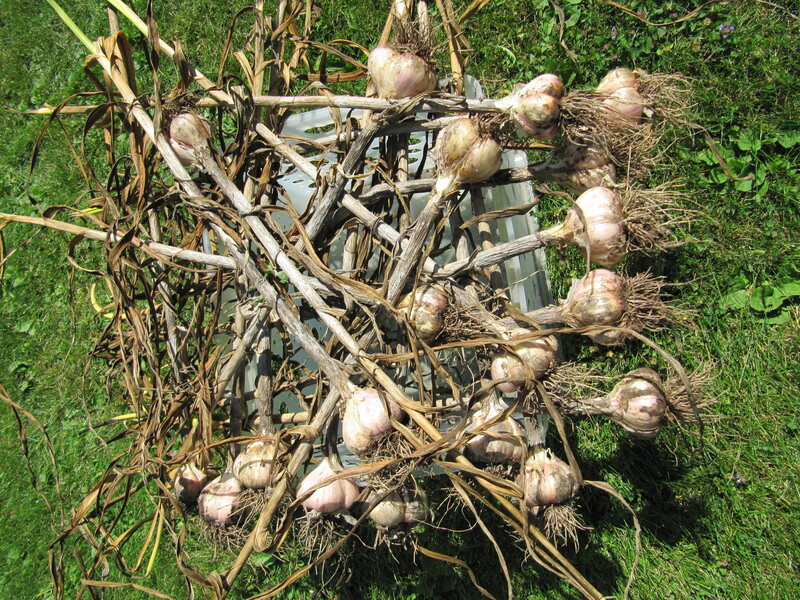 This past fall I planted two varieties of garlic. One was ready before the other and that I started using, then pulled and braided so I can use it over time. The other variety has been ready to go for a couple weeks but I have not taken the time to yank it from the dirt and cure it to store it. Every day I think about it and tell myself I will get to it, but so far no dice. Tomorrow I hope to dig it up and start drying it. Seriously. Tomorrow. I picked my first onions a couple days ago. I planted Cippolini onions–flat and sweet. They are tasty but hoo-ra! Those puppies do a number on the old tear ducts. When I chopped half an onion for my first salsa yesterday, I had to set down my knife. Dicing with eyes closed is hazardous. Luckily it was windy. I opened the window and it was enough to clear the air. I have gotten used to mild onions so I was surprised by this once typical occurrence. I will be ready next time. Seriously. I need to pull more of those onions. They don’t keep well so I will have to use them fairly soon, but I might have some into the fall. Unless I use a lot of onions, which I tend to do in the fall especially. The bummer is how few onions I will get. I planted 48 small pots in late winter. Most of them sprouted, but I transplanted them too late–so goes my theory. I will have maybe 20 onions if I am lucky. The leeks also didn’t fair as well as I would have liked. 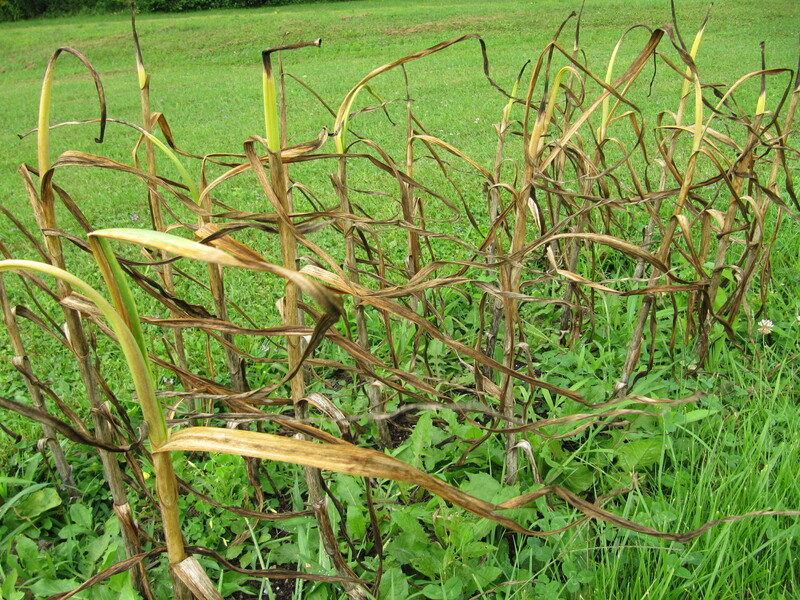 Again, I think I planted them too late in the spring. They just wanted to get outdoors earlier. I can’t blame them. Last year I had a forest of leeks and only three onions, so I guess it all balances out. Tomorrow I need to muck about in the dirt. I made some serious progress on painting the house today so the garden chores got delayed. Tomorrow, however, rain showers are forecast for the whole day. That means other projects might get some attention. I need to sort through our tax returns for the last 15 years. We don’t need to keep all of them, do we? That task, however, will take a back seat to pulling garlic and maybe to making a batch of pesto. I guess I prefer food over finances. Finally today I was able to make the salsa I have been hoping to make this summer. I had wanted to make it fresh, with ingredients I grew myself. I almost succeeded. I tossed together your classic pico de gallo. This calls for just a few ingredients: tomatoes, garlic, onion, pepper/chiles, cilantro, salt and lime juice. I do not have an active salt mine here at the house, and limes just don’t grow well here in the northeast, so those were added, but all the other ingredients were my own. And it was, I don’t mind saying, delicious. Of course, fresh salsa is pretty dang good food anyway, but this had the benefit of being near and dear and personal and all that business, so I thought it was particularly tasty. I brought it to a potluck party and it did all get consumed, so there must have been something more than my own eager ego at work. I will make it again if the cilantro pulls through. I picked pretty much all of it from one small plant. This plant had been munched to nubbins more than once by our friendly neighborhood Silvilagus, that cute little long-eared mammalian rascal. Several other cilantro plants are happily growing now, but they are small. I need time, I tell you. Last year we had lots of cilantro but no tomatoes. This year the opposite is the case. Timing is key and that isn’t happening in my garden. I will make the stuff–pico de gallo–again. I may have to find some other cilantro, however, to make it happen in the near term. Did you know that pico de gallo means “rooster’s beak” in Spanish? What the hell is that all about? Maybe I’ll just call it salsa.